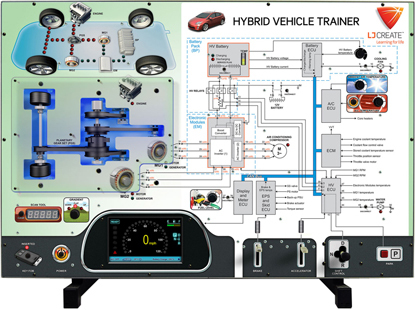 This trainer provides students and instructors with the opportunity to demonstrate, investigate, and fault-find a simulation of a hybrid vehicle electrical system. The trainer is designed to allow access to a simulation of the mechanical operation as well as provide a mimic of the electrical power flow. The panel also includes test points at a safe voltage level to allow for investigation of electrical circuits. To facilitate the development of techniques in diagnostics and fault-finding skills, the panel includes a range of fault-insertion options to simulate typical real-world system malfunctions. The included automotive curriculum-based learning content provides students with hands-on learning opportunities. This easy to use software also contains theory presentations, virtual investigations, and support materials to underpin the practical tasks.